Welcome to our monthly column describing insurance coverages you may have questions about, including different areas of home, auto and business owners’ policies. With the recent losses to many across the country due to hurricanes, floods and fires – not to mention earthquakes – you may have experienced the devastation firsthand. We want to help you better understand what you might need and can afford. Renter’s insurance provides financial reimbursement to cover a tenant’s lost or damaged possessions as a result of fire, theft or vandalism. It also covers a tenant’s liability in the event that a visitor is injured on the premises. 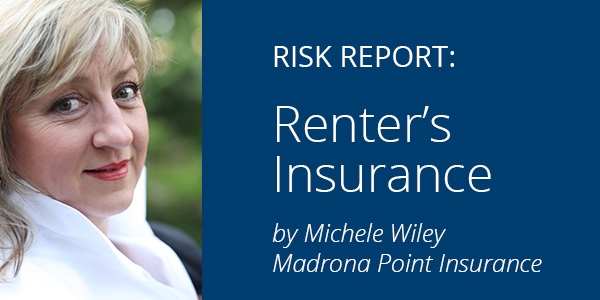 What does renter’s insurance cover? YOU! Most landlords require renter’s insurance so they are protected for your visitors, and the policy covers your belongings not covered on their policy. Renter’s insurance protects the renter, homeowners insurance protects the homeowner. It might seem that these policies would offer pretty similar coverage, and they do, except for one big difference: when you own a home, you own the structure and the contents, and so, as a renter, you need a policy to cover what is yours. In the next column, I’ll cover homeowner’s insurance. Please feel free to contact me with any questions.